Just over the bridge from Old San Juan and Puerta de Tierra, Condado is one of Puerto Rico's most fashionable places to call home. Cartier, Louis Vuitton, and Ferragamo are among the names you'll see on the storefronts here. Sophisticated bistros and restaurants draw lively crowds at night, and the beach is always popular. Interestingly, Condado's hotels don't follow the high-end trend; you can find great deals that put you in the heart of San Juan's ritziest neighborhood. 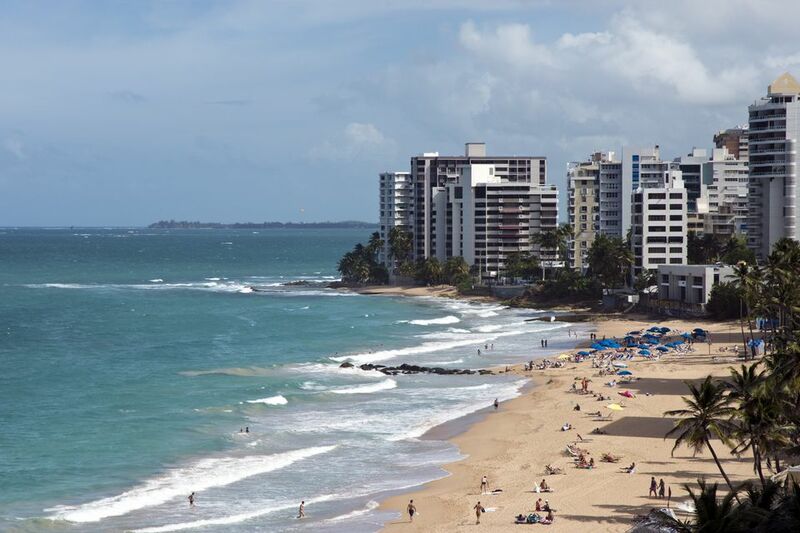 Condado has a mix of mid-range hotels, inns and bed & breakfasts. Casa Del Caribe, a homey B&B in the heart of Condado, is one of the best budget hotels in San Juan. At Wind Chimes Inn is a favorite hotel in Condado and one of its top bargains, especially during the off-season. Acacia Seaside Inn is a pleasant boutique hotel steps away from the beach. Gamblers will want to bed down at the sprawling Condado Plaza Hotel & Casino or the family-friendly Marriott San Juan Resort & Stellaris Casino. Fine dining, eclectic fusion, international flavors... you'll find it all in Condado. The seafood-focused Perla restaurant is among the most beautiful scenes in the city; located in the beautiful La Concha Resort, it's the hotel's flagship fine-dining institution. It's also an architectural wonder: In 1958, famous Italian architect Mario Salvadori designed the clam-shell pavillion, which sits on an infinity pool elevated above the beach. Bangkok Bombay has, surprisingly, equally good Indian and Thai menus, and wicked lychee martinis. Yerba Buena is a lively place that brings Cuba to Condado. Condado's entertainment is centered on three main activities: shopping (see below), the Miami-like Condado Beach, and the casinos. Two of the area's top casino hotels in San Juan are here. Of all the casino hotels in San Juan, the Condado Plaza feels most like a Vegas property. It's the first hotel you come across as you enter Condado from Old San Juan. At over 12,000 square feet, its casino is among the largest in San Juan, featuring more than 400 slot machines, Blackjack, Craps, Roulette and Texas Hold-em (this is one of only a handful of casinos in San Juan that has Hold-em games). When you're ready for a break, check out the Cocolobo lounge and club for drinks, food, and live music. The neighborhood is also home to several small parks—urban oases that make for a pleasant break when you're out shopping. Additionally, there are plenty of outdoor activities, such as stand-up paddle boarding, yoga, and surfing schools in the area. Retail shopping is where Condado shines. Check out some of the brand names you'll find on Ashford Avenue, the Puerto Rican equivalent of Fifth Avenue: Cartier, Louis Vuitton, Ferragamo, Furla, and Hellmuth. There are also some smaller independent boutiques worth visiting in San Juan. Nono Maldonado is one of the island's best designers of menswear, women's clothing, and contemporary interior designs. A high-end boutique for men, Monsieur features distinctive brands like Bugatchi Uomo, Stone Rose, Ballin, and Robert Graham. Anyone looking for an elegant shirt, perfect-fitting pants, and a polished, masculine finished product should head straight to this fashion stalwart in Condado. David Antonio is another well-known and internationally respected local designer. In a nondescript section of Condado, Mademoiselle (nothing to do with Monsieur), specializes in French and European fashion. The boutique stocks exclusive brands like BleuBlancRouge, Newman, Gerard Darel, and other in-vogue fashions from Italy, Spain, France, and Germany. Meanwhile, Hecho a Mano (which means "handmade" in Spanish) sells handmade clothes and accessories made using organic materials for a warm, natural look. The company works with handcraft workshops in Puerto Rico as well as workshops in Indonesia, Thailand, Nepal, Bali, and more. You'll find an assortment of flowing dresses, wraps, and tops, along with handmade jewelry and other accessories. Beyond the casinos and restaurants that stay open late into the morning, you have few nightlife options in this neighborhood. Eternal, the lobby-level lounge at the Conrad Condado Plaza is one of the hottest late-night hangouts in the neighborhood. Equally stylish and chic is the lobby bar at the La Concha Resort. For night owls and party animals, Kali, an Eastern-themed lounge and restaurant, doesn't get going until 2 am.